Image credit: Pnyx hill in Athens by Qwqchris. CC-BY-SA 3.0 via Wikimedia Commons. Paul Cartledge was the inaugural A. G. Leventis Professor of Greek Culture in the University of Cambridge, and President of Clare College, Cambridge. Between 2006 and 2010 he was Hellenic Parliament Global Distinguished Professor in the History and Theory of Democracy at New York University. Over the course of his distinguished career he has written and edited numerous books on the ancient Greek world, including The Greeks: A Portrait of Self and Others, Ancient Greece: A Very Short Introduction, and (most recently) After Themopylae, all also published by Oxford University Press. He has also served as historical consultant for the BBC television series The Greeks, and for four Channel 4 documentaries including The Spartans. 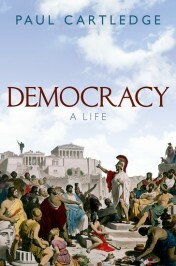 His latest book is Democracy: A Life (OUP, 2016). Would many ancient Greeks not also have thought that selecting ‘randomly’ allowed the gods to play a part in decision making?